The birthplace of Velveeta cheese, Monroe is a quiet, small town in Orange County. This town is just a stone’s throw from New York City, and its downtown area offers a vibrant and active community. 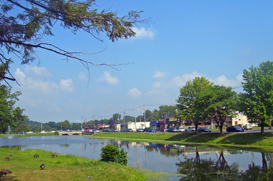 Monroe’s Main Street is located around Crane Park, offering a beautiful and scenic downtown area. The town has several coffee shops, restaurants, fitness centers, even a dance school and a tutoring center! Looking for a bite to eat? Try La Vera Cucina for some Italian cuisine! Children in Monroe attend Sapphire Elementary School and Smith Clove Elementary School for kindergarten to first grade, then Central Valley Elementary School, North Main Elementary School, or Pine Tree Elementary School from second grade to fifth grade, Monroe-Woodbury Middle School for sixth to eighth grade, and Monroe-Woodbury High School for ninth to twelfth grade. Bus service is provided by Coach USA to The Port Authority Bus Terminal in midtown Manhattan. Train service is provided by NJ Transit from the nearby Salisbury Mills-Cornwall Station to the Hoboken Path Station, where you can transfer to the World Trade Center PATH Station in lower Manhattan.